This event will be held at 2PM on Saturday April 27th. Admission is free to the public ($5 donation is requested from members) and will take place in Room 106 of 42 Silicon Valley (formerly known as DeVry University), 6600 Dumbarton Circle, Fremont CA 94555. Thank you, everyone, for posters, bulletin board notices, newspaper articles and ads, word of mouth…being welcoming and helpful; that’s what it’s all about. We’re excited to have the need for a larger room at our meeting place (now in Room 106 at 42 Silicon Valley—formerly DeVry University in Fremont). I know some think it’s too cold, but the old room was really stuffy, and I’d rather don a heavier shirt or jacket than sweat in a thin shirt! And it gives us lots of room to grow. The excitement and action is growing at the Half Price Books “Second Saturday” events, as well as at our meetings. And I hear from some of our movers and shakers that we are scouting locations for additional Open Mics and new critique groups. More on these, as things develop. Don’t let the fire die down, keep stoking the flames! I see more youth showing up, and activity levels rising. Our celebration year is in full swing, and people are accomplishing forward and upward progress! We will continue to highlight our past leadership and remember those who’ve supported this branch from the beginning, and strive for greater heights moving forward. Anticipation is building as we prepare for our Picnic on July 6th at beautiful Lake Elizabeth in Fremont for a relaxing and refreshing time to bring family and friends together to chill and reflect and network. Planning for accolades and celebration and workshops for our year-long 10th Anniversary Celebration continues. If you want to join in the fun, speak to one of our Board members and we’ll happily find an opportunity for you to participate in the festivities! Be sure to read through, and contribute to our monthly newsletter, Ink Spots…lots of Fun Facts and updates, as well as sharing of ideas and talents. KEEP the DREAMS ALIVE and GROWING! 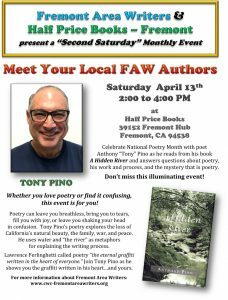 Fremont Area Writers is now partnering with Half Price Books in Fremont to present “Meet Your Local FAW Authors” monthly readings by FAW published authors on the second Saturday of each month. Readings will be scheduled from 2:00 to 4:00 pm. A different author will be featured each month. Authors will have the opportunity to read and answer questions about their work, as well as sign and sell their books. April 27- Cathy Dana – see this page. Jan Small nominated for Jack London Award! Congratulations to Jan Small, who won Fremont Area Writers nomination for the CWC’s highest honor for local group accomplishment: The Jack London Award. Jan has been searching out sites for FAW book-signings and organizing everything from setup, take down, author recruitment and publicity. She’s even designed the promotional posters. The Award recognizes outstanding service to a CWC branch and will be presented at the regional meeting later this year. Thank you, Jan, from all of us! The purpose of the Jack London Award is to honor a branch member whose service to the California Writers Club (CWC) and/or a branch has been exemplary. Each branch may select one award recipient biannually in odd-numbered years. The award is presented at the July annual CWC meeting of statewide representatives. Carmen VonTickner has agreed to fill the vital Board position of Secretary. Carmen began her new position at the last meeting on January 26, and has hit the ground running. Thank you Carmen! Remember to bring your used books to the Book Exchange Table at FAW Meetings. Books you bring are free to members. Take any you like, but at the end of the meeting, if yours have not been selected, please take them home and bring them back next month. If you especially recommend a book, put a marker in it with a brief note to let folks know why it’s special! Members can save a fortune by recycling books instead of buying news ones! 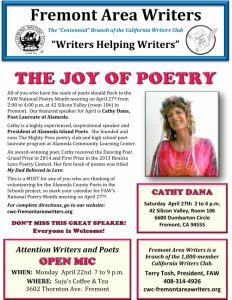 Fremont Area Writers has lots of great volunteer opportunities! If you’d like to to make a positive contribution to these projects please, contact our President. Send your Book Cover jpgs to webmaster@’this website URL’ for our Members’ Book Display, then check out other members books and if you can give them a 5 star rating, go online to Amazon, Goodreads or other websites and post your review for them. This is one of the most important ways that we can help each other out! FAW has a 45 minute membership meeting. 15 of those 45 minutes are set aside for up to thirty members to practice their 30-second “elevator speech”, introducing themselves and their projects. An elevator speech isn’t social chit chat or a biography. It’s a quick teaser to use at professional events, like conferences, where agents and publishers are looking for product to sell. Each of them is looking for specific types of product that they have a market for. If they don’t need what you have to sell, you need to move on and keep moving until you find your possible connections. Once you’ve each introduced yourself with your name and role (Author, Agent, Publisher) you have 30 seconds to let them know what you have to offer: Your book’s genre, target audience, plus a couple of interesting details and what support you’re seeking. IF that’s what they’re looking for, you exchange more information. If not, you exchange quick pleasantries and move on until you find a more suitable match. You may need to present to many, many people before you meet one who’s after exactly your project. with the right needs. While it’s important to be congenial, it’s not time for normal socializing . After thirty seconds, if you haven’t already moved on, your contact will either be interested or be scanning the room for their next prospect. THIRTY SECONDS! At Every FAW meeting you can polish and refine this vital skill and get feedback afterward, at break. Going over that time at a conference risks losing your new contact’s interest or creating a situation where they feel like they can’t get away from you. 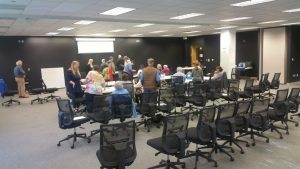 Going over that time at an FAW meeting will only get you buzzed, because, though we love you, we have other agenda items and only if everyone sticks to thirty second introductions, afterwards we’ll only have 30 minutes of meeting time left! So start planning your next elevator speech now. Time it out, and we’ll see you at the next meeting! 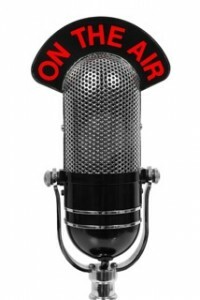 Anyone have a productive Agent that would be a good speaker for an FAW meeting? We need someone who’s current and can give productive tips to our members about how to choose the right agent, then how to work with them. Please email Knuti. Are you looking for fame and fortune? While you’re working on that, how about learning the ins and outs of websites? Please offer to help maintain this site. Training given. Contact the webmaster. In this area we record writers’ awards and successes. Keep your eye on this page as awards are received all the time. I’d like to post a shout-out for Nancy Guarnera’s inspirational work in infusing energy and innovation into the FAWG organization, in particular, her transitional affiliation with Half-Price Books, where she has founded second-Saturday Local Writers Reading meetings, as well as her work on renovating the FAWG logo, webpage and public persona. Tish Davidson has been selected to judge the historical nonfiction and regional nonfiction categories for the Next Generation Indie Book Awards. This is an international competition sponsored by the Independent Book Publishing Professionals Group. Books written in English from small presses, mid-size independent publishers, university presses, e-book publishers, and self-published authors are eligible. Winners are recognized with cash awards and review by a literary agent at a ceremony in Washington, DC during the American Library Association Conference in June. Penelope Anne Cole has had three pieces published in the Tri-Valley Writers Anthology: Voices of the Valley. Her published pieces are a poem, “Captive of Love,” a memoir, “Escape from Honolulu,” and a short story, “Roamer’s World.” She is most proud to have been so honored. Jan Small was nominated by FAW board for the Jack London Award on January 26. Art Carey’s modern, tongue-in-cheek version of Jonathan Swift’s classic satire, A Modest Proposal, appeared in an August issue of The Satirist, America’s Most Critical Journal (Since 1999). The following authors who participated in the FAW Book Signing at the Newpark Mall on Saturday, July 14th : Art Carey sold 1 book; Penelope Cole sold 11 books; Paul K. Davis sold 1 book; Chris Dews sold 3 books; Jo Ann Frisch sold 5 books; Urmila Patel sold 4 books; Jan Small sold 2 books and 1 art print; Dave M. Strom sold 1 book; Anita Tosh sold 1 book; and Helen Vanderberg sold 3 books. A total of 32 books and 1 art print were sold for total sales of $402. Sales per author ranged from $2 to $95. Chris Dews has recently published a new book – Antler Jinny and the Raven, and has revised and republished his previous book, The Druid and the Bracelet. His books will be available at Coastside Books and Ink Spell Books in Half Moon Bay. You can also find them online at Amazon and Barnes & Noble. Evelyn LaTorre, an FAW founding member, will have her memoir titled, No Guardrails, From Montana to Machu Picchu, A Peace Corps Romance, published in 2020 by She Writes Press. Clevermag.org has notified Evelyn LaTorre that her piece about her recent trip to Ireland, “Is Ireland Really Heaven,” will be published in the Fall 2018 issue of their e-zine. Dave M. Strom recently updated his book, Super Holly Hansson in Super Bad Hair Day to roughly 120 printed pages of stories, audio scripts, and Super Holly artwork. At Worldcon, the annual convention of the World Science Fiction Society (WSFS) recently held at the San Jose Convention Center, Dave shared a table with authors from the South Bay Writers branch of CWC. 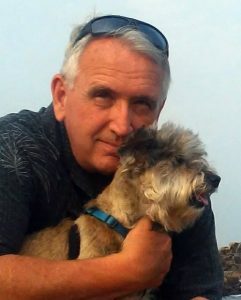 He sold nine paperback copies and one Kindle eBook. A long-awaited anthology about the life of a dollar bill has been published by South Bay Writers. FAW’s Dave Strom was an editor and has a story in it. Tish Davidson’s non-fiction piece “Miss Tish and the Okree Ladies” has been published in the 2018 California Writers Club Literary Review. Evelyn LaTorre’s non-fiction piece “The Potato Caper” has been published in the 2018 California Writers Club Literary Review. Judy Taylor’s poem “A Trail of Pap Crackers on the Beach has been published in the 2018 California Writers Club Literary Review. An Open Mic for writers to read their work is held from 7-9 p.m. at Suju’s Coffee and Tea, 3620 Thornton Ave., in Fremont, on the fourth Monday of the month.